After working with Sven Mann on two LIYR's albums, Alexandra Nordrac started a dark ambient project TREFLE NOIR. 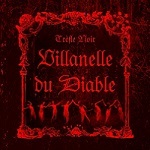 Her first album " Villanelle du Diable" leads us into a dark and poetic universe. Inspired by French poetry from the 19th century, the texts lead us through the maze of death, near borders of the afterlife, witchcraft and madness, and all this on a dark and scary music, mixing of soundscapes, drones and percussions.